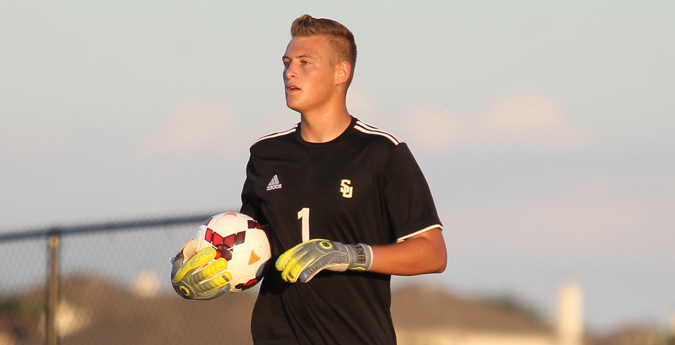 SAN ANTONIO – Southwestern closed Southern Collegiate Athletic Conference regular season action on Friday night, losing 4-0 to the top team in the nation, Trinity. The Pirates played well in the first half in front of a hostile crowd, allowing one goal in the first 45 minutes. Simon Uribe scored unassisted in the 20th minute to put TU up 1-0. A second goal in the 54th minute made the deficit bigger for Southwestern as Zac Treu pushed on in the back of the net. Goals in the 80th and 88th minutes gave the Tigers a 4-0 lead and Southwestern wasn’t able to get a run going as the final buzzer sounded. Trinity out-shot Southwestern 30-8 and had six corner kicks while the Pirates got just one corner opportunity. Travis Carmichael posted ten saves on 14 shots on goal while his counterpart, Matt Cardone, had four saves in goal. Southwestern falls to 7-10-1 on the year an d7-6-1 in the SCAC, but retain their #3 seed for the SCAC Conference Championship next weekend. Trinity, at a perfect 14-0 in conference, 18-1 overall, will secure the #1 seed after the win. Southwestern will most likely Schreiner in the first round of the SCAC Conference Championship on Friday in Seguin. Game time is yet to be set.